May 8, 2013 2 comments on "Lucky Bamboo Care"
Lucky Bamboo is surprisingly easy to take care of. Keep it where it is warm (preferably indoors away from direct sunlight), give it lots of water (distilled, boiled and cooled water, spring water…etc). I don’t have a GREEN THUMB so it’s like a fish…I just popped a curly Lucky Bamboo into a Lucky Bamboo vase, filled it up to the brim with water and forget about it! It is THRIVING like crazy! If you want to give it a little fertilizer, you can buy a fertilizer that’s just for lucky bamboo. When buying, try to buy ones with roots…and YES I do know the smaller in size the cheaper…BUT SMALLER ONES WILL DIE! Really! They are too weak and the hardest to take care of! For only like a dollar or 2 dollars more you can get one that is inches larger and stronger. Another thing is, Lucky Bamboo can last you a lifetime (my grandma has her mother’s on top of the refrigerator). So I think it worth the $0.75 – ??? (can be expensive sometimes for the special designed ones)…if you can have it for a lifetime. You can also multiply them (I wouldn’t recommend it…but try it with the bigger shoots). Bamboo shoots out these green leaves….if one breaks off..don’t despair! Just pop that shoot into a small cup with LITTLE (maybe an inch?) water…and soon it’ll root! Tip #1: Take off all the yellow. It will just rot if you don’t. Make sure your bamboo is not in the sun and that it has plenty of water. Tip #2: Don’t use tap water with chlorine on your bamboo and change the water at least once a month. The yellowing will show up more often if the plant is in a location that is hot or too sunny. Tip #3: I cut mine off. It is also recommended that if you use tap water that it should set at least 24 hours before watering your plants. I use convenient orange juice containers to store my water under the sink. Simply Orange & Tropicanna plastic jugs are easy to use. Tip #4: I found out, do NOT put miracle grow in the water. My plant turned yellow from it. Tip #5: The florist my husband bought my bamboo from recommended distilled water. He said our tap water will turn the leaves yellow. Tip #6: Yellow leaves mean the roots are too wet almost wet enough to rot. All you need to do is dump out the old water let it dry for a few hours and put fresh water in. Now that you have seen this you will need to change the water more often. Big key try not to let it be in standing water, that would start the rot again. GOOD LUCK! Tip #7: Yellowing is either too much water, too much direct light, or a disease which will kill the plant. Remove all yellowing. If there is yellowed stalk, separate the stalk from the other plants. It will spread to them. Tip #8: A little hint of how to grow lucky bamboo. Put it in a shallow bowl or container, place a few rocks on the bottom, place bamboo inside and keep fresh water in it at all times. Every so often drain the water and refill with clean water. I have had the good and bad happen to my plants but most have survived. As soon as you see yellow, clip it off. I don’t know the difference between the disease and over/under watering. If it has hit the stock there is no use. Throw it out. If it has hit the stock but not the outgrowth, clip off the outgrowth and place that in water. Most times it will spout right away and you haven’t lost anything. If you want more plants, I suggest buying a three tiered plant arrangement and take it apart. Around my house, I have about 6 sets of plants that are thriving. Tip #9: I have many bamboo plants. Typically when bamboo shoots turn yellow it is because they are not getting enough water. What I have done with my plants is If they are in pebbles or rocks I make sure to fill the container all the way with Distilled water. I use clear vases, that way you can use colored pebbles and still be able to see the water level. You also need to make sure to wash the container they are in regularly about once a month, especially if some to the stalks have turned yellow. I hope I have been some help. Tip #1: You can cut the bamboo shoots where they come off the main stalk. I put them in water for a while to root and then put them in another container and now you have more lucky bamboo. It is hard to kill. Tip #2: I had one that had grown very tall and heavy as you describe. I cut mine below the nodgule on a 45 degree angle and put it in a jar with water to restart all over again. Hope this helps. Tip #3: To trim your bamboo, determine the height you want it to remain, and using a sharp knife, cut the ‘pole’ just above the sprout. Then place the cutting into water and begin a new plant! Remember, sprouts will continue to grow out from the top of your original plant, so you may have to trim again down the road. As for the roots, you can certainly trim off larger ones (a few at a time right at the base) or trim down the length of some of the smaller ones, whichever is easier for you. It is very hard to damage these wonderful plants. I have one in a room that is dark almost all the time and it still thrives. One thing to remember, keep the water level at no more than 3 inches from the bottom of the plant. I place rubberbands around each of mine at about 3 inches so I can tell how high they should be filled. Q: I bought some Lucky Bamboo a few weeks ago. It’s in a pot with gravel and water, only thing is it is all tied together and it is growing. Tip #1: The only advice I ever received about these Lucky Bamboo was to make sure they are always in water. You can plant them but I never had any luck. I have some like yours that I’ve had for a couple of months…They are just fine. Hope this helps. Tip #2: To grow new stalks, make a clean cut through the stalk, seal the top end with some wax. Place the cutting in fresh, clean water with some rooting hormone (use directions on rooting hormone package). Refresh this mixture at least once a week. 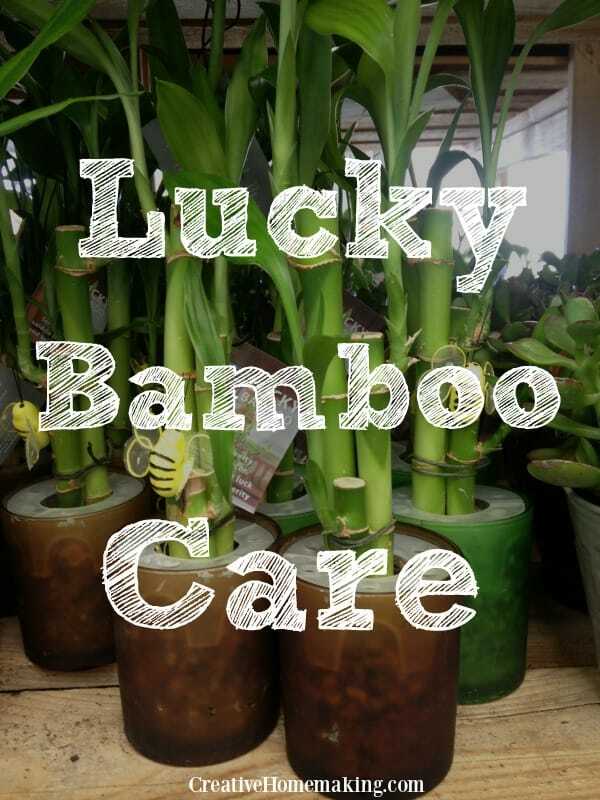 Q: I have 5 really good size lucky bamboo’s and have been told that you can plant them in a pot in soil is this true? They are at the moment in a vase on my window ledge but are becoming very big, I have young children and knowing my luck if I put them on the floor, my children would no doubt knock it over. If there is a way of planting them in soil indoors I would be grateful to know thanks. Tip #1: If you do decide to plant them in soil, remember to always keep the soil damp. However if the stem or leaves turn yellow, you must remove the stalk at once since that individual stalk plant may be infected. This is why growing it in water is better than growing it in soil. You can clean rocks, you can’t clean soil. Q: I am interested in the lucky bamboo plants. I bought one from Wal-Mart a couple of months ago and it is the one that is straight up. Tip #1: If you want to take the time to train it, put the bamboo in a greenhouse or room where light comes from only ONE side. The bamboo will naturally grow towards the light. You can then periodically rotate the bamboo around until it forms a spiral. It is a labor intensive process though. Tip #2: I was interested in how the curling of bamboo was done. Found out from a distributor at the Chicago Flower & Garden Show that it is done in Thailand. Before it is exported it is grown on mountainsides very slowly around a bottle that is hand rotated every so often. So much for that! Q: My name is Anne and I am getting married in 19 days. We decided to make our own centerpieces of 12″ lucky bamboo. Great idea, we thought. Well. We couldn’t find vases that were thin enough for the bamboo so we bought some about 6″ high (they were not cheap and heavy so we don’t want to return them due to return shipping costs) and they are about 2″ wide. We need to figure out a way to get the bamboo to stand up straight. Any ideas? We tried styrofoam, it broke into pieces. We filled the vases with fish rocks, which helps, but we need to figure out a way to keep the stalks standing straight up so they look nice during the wedding. Any ideas will be very appreciated. 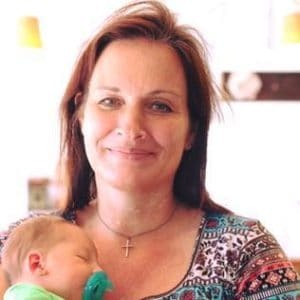 Tip #1: Hi my name is Sandi, and I have the Lucky Bamboo you’re talking about in a vase. I used small river stones to hold my plants up straight. It works great. You can buy them in a craft store. They come in various sizes and they look great. Good luck and congratulations. Q: Do I have to put rocks in with my bamboo or can I put marbles in with them? Thanks. Tip #1: Rocks, marbles…makes no difference…either are fine. Q: I have a lucky bamboo and I’d like to add a fish in it (a Beta). Is it a good idea? Tip #1: I saw this at Myrtle Beach this year at the stores. They actually had bamboo and betas together. I guess you do it the same way as with the vases. Just add fish to water and bamboo. Distilled water or dechlorinated water with the pills you buy at the fish store. I believe they were like 23 or 28.00 one. 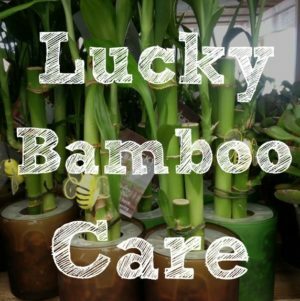 2 Comments on "Lucky Bamboo Care"
I have lucky bamboo in soil is it a good idea? Hi! I have not tried that but it is my understanding that you can grow lucky bamboo in soil as long as you keep the soil very wet, because the lucky bamboo needs the extra moisture.